If your new year’s fitness resolution has not met with much success yet, allow us to give you a nudge in the right direction with our list of places in the city delivering healthy food right at your doorstep. Stay healthy with these home-delivered lunch packages by Diet Box. The dietary box is only INR 125 and comes with healthier versions of their home-made classics – tawa roti, sauted veggies, green salad and sugar-free sweets. The boxes come well-packaged and are a perfect option for office lunches. Eat Out At Home’s detox meals will help you shed your junk food calorie and guilt count! Indulge into a variety of soups and salads ranging from Citrus Avacado Salad, Vietnamese Edemame Salad to Moroccan Lentil Soup, Leek Onion Soup and much more. They keep having Crunch Week challenges at regular intervals with specially designed diet menus. We will all agree that ‘ghar ka khaana’ is the best kind of health food there is. Bhookh Pitara serves up garma-garam Naani ke paranthe. They even have Ghar ki Yaad combo, a thali laden with roti, rice, daal, paneer, bhindi, raita, salad and even a sweet – the taste of which would take you to the khaana served by Ma at home. Rajma-chawal, daal-chaawal, kadhi-chaawal, all our classic home-y faves make their way on to the menu too. Everything tends to be on the healthy side, with minimal oil and masalas, which means that eating out doesn’t always mean eating unhealthy. The thalis start at INR 129. NightKitchen can be your knight in shining armour who is ready to feed you tasty and healthy food even in the dead of night. So no more bingeing on leftovers, as they prepare everything fresh for the midnighters. There are healthy options like Caesar and Greek salads, light meals like the seafood soup of Zuppa. Need more fuel to keep the midnight oil burning? They have mains like Singapore fried rice, garlic chicken, chilli fish and more. All priced reasonably within INR 300, NightKitchen delivers across the city. Remember to place your order at least an hour ahead. They are open to take orders till 4 am in the morning. Want a heart-warming, healthy, home-style meal delivered to your doorstep? Khichdi does exactly that. Pay as little as INR 120 for a taste of home that will make sure you don’t need to loosen your belt. Finish your meal with a brown rice firni – a healthier option than the regular kind. 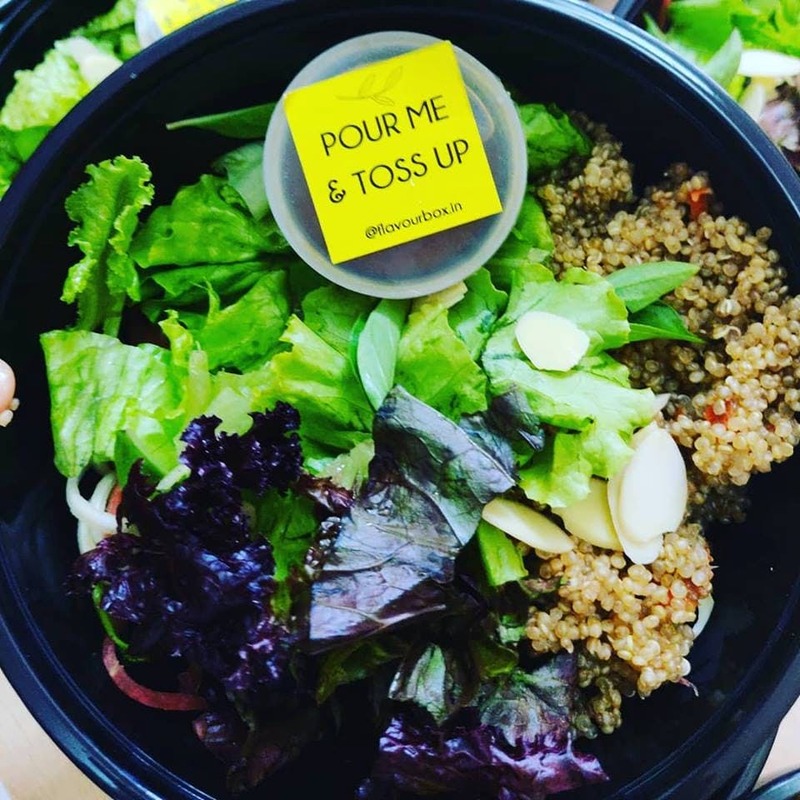 If you’re on a diet, Flavour Box is perfect for you, as it has quite a number of healthy options like the Asian take on watermelon feta salad with Asian greens- tangy, spicy and low fat! One of their most popular dish is the Nasi baka rice wrap, an Indonesian dish where rice cakes are wrapped in banana leaf with a medley of mushrooms, grilled on a tawa, and served with peanut sambal. Want a completely protein-free meal? Try their Khowsuey and Thai Papaya Salad (INR 200). Get fresh vegetarian (and Jain!) thalis at INR 120 for the mini thalis and INR 170 for the regular and Jain varieties. Apart from the roti, rice and sabzi, you also get 100% vegetarian pappad, achar and salad. Led by Seema Gupta, this home-run unit provides quick food that is low on oil and perfect for veggie lovers.